Welcome to the Century House Games Room – Snooker and Pool Group page. What We Do:The Snooker/Pool Room has 4 slate tables, 5′ x 10′, and all of the supporting equipment required for both new and old members. The tables are kept in excellent shape by the management committee and are enjoyed by all who participate. Current membership is between 45 and 50 players. 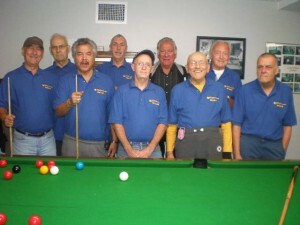 We are currently enrolled in the Lower Mainland Senior Snooker League and actively participate with 10 other teams. This provides a lot of fun and comradeship and challenges us to improve our skills. We have done well since joining the League 2 years ago, coming in second in the finals both years. There is no push to be competitive, the main purpose of the Group is to have an enjoyable and social time. Who Can Join? : New members are more than welcome. We would also welcome ladies to the group. Requirements to join are current Century House membership and payment of the annual group fee. This allows you almost unlimited access to the Games Room. New members are warmly welcomed and for those not familiar with the games, there is usually someone to help out and nurture you along as you learn. For more info, please feel free to drop down to the Games Room and meet some of the members. Someone will be more than happy to show you around and answer your questions. We have a 3 free visit try-out policy so you can make the decision to join.